A 67-year-old man presented with a Zone I open globe injury of the right eye from an arrow resulting in a stellate laceration at the corneal limbus. 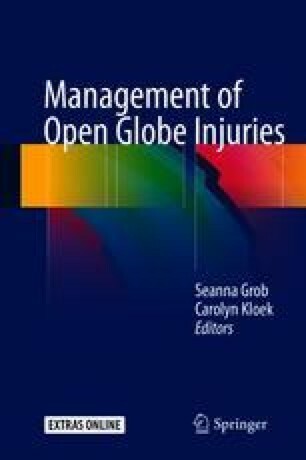 The patient underwent a standard repair of the globe injury. His post-operative course was complicated by Seidel-positive leakage from the center of the stellate wound that failed to epithelialize. This was treated with two applications of cyanoacrylate corneal glue and bandage contact lens (BCL). The patient also developed an inflammatory reaction with elevated intraocular pressure accompanied by iris and corneal neovascularization, which was presumed to be secondary to the corneal glue. He was treated with an intensive course of topical steroids following removal of the BCL and corneal glue with resolution of corneal and iris vessels, and final best-corrected visual acuity of 20/25.